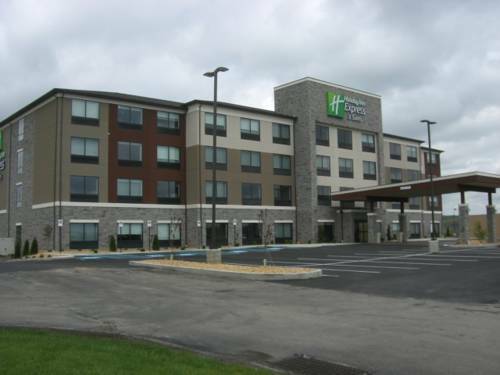 Welcome to the Holiday Inn Express & Suites Uniontown located next to Routes 40 and 119. We are one of the newest hotels in the Uniontown area. We are located in the Laurel Highlands area and close to many attractions for the nature, history or outdoor enthusiast. Enjoy Laurel Caverns, Fort Necessity National Battlefield, Frank Lloyd Wright's Fallingwater, Ohiopyle & many other immersive locations. Whether you are visiting for business or for pleasure, you will find everything you need to enjoy your stay while in Uniontown. We are close to Penn State Fayette Campus and not far from WVU. Conveniently located 46 miles southeast of Pittsburgh PA and 26 miles north of Morgantown WV. For the business traveler, we offer high-speed internet access which makes sure you stay connected to the office and our business center is open 24 hours. No matter what brings you to Uniontown, our hotel is a great place to find comfort and convenience. You can take a dip in our indoor pool or break a sweat in the 24 hour fitness center. Enjoy the complimentary Express Start Breakfast Bar, which features items like eggs, bacon, fresh made pancakes and our signature cinnamon rolls. Visit our sundry shop, for your convenience we have many of your forgotten toiletries, cold drinks and snacks. Make a reservation today so you can experience all Uniontown has to offer. Meeting room can be set up for classroom, U shaped, hollow square, conference, and team. Meeting room is about 500sq feet. 18 hole regulation length golf course.